Storage containers represent uniquely effective, efficient and convenient solutions for commercial and industrial use. When self-storage at our own facility doesn’t suit your needs, we offer storage containers for hire in a variety of shapes, sizes and specifications. Cheaper than an extension and comprehensively affordable, there’s no easier way of expanding your current on-site storage space. What’s more, every storage container we hire is available for short-term and long-term use alike – flexible container rental services for maximum convenience. Whether looking to store equipment, small vehicles, furniture or anything else on a temporary basis, we’ve got the ideal storage containers for hire. Choose from a variety of specifications and let us take care of delivering and positioning your containers, exactly where and when you need them. Prior to ordering, we’d be delighted to welcome you to our site just off the M25 for a closer look at all of our storage containers for hire and to discuss our best hire prices. 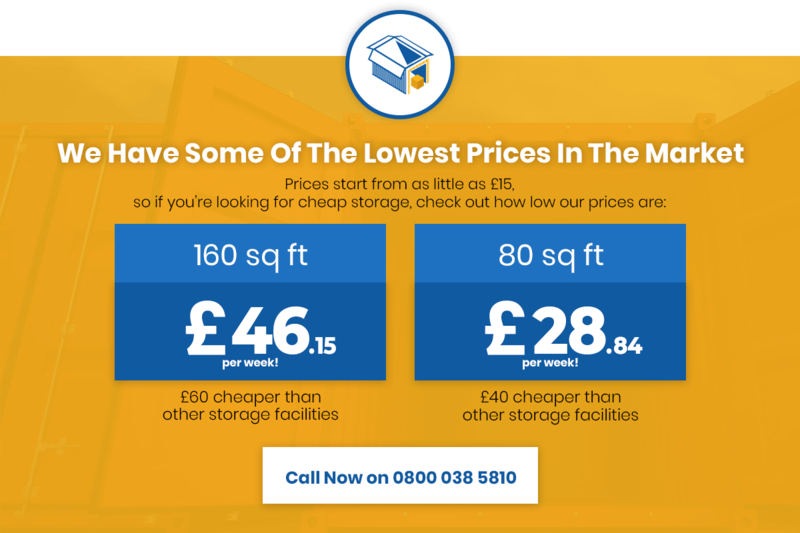 We take pride in offering self-storage and container hire services for at least 30% lower prices than the market average. Whatever you’re looking to store and for whatever duration, you won’t find a better deal at a better price on storage containers for rent anywhere in the region. We work hard to offer the most dynamic, flexible and affordable container-hire service in the region. Along with our commitment to low prices, we’re also proud to offer a wide variety of containers to suit commercials, industrial and other projects of all shapes and sizes. Whatever it takes to get the job done, we’ve got you covered! Just a few examples of the containers we’re happy to hire include canteen containers and other on-site facilities, portable toilet hire, office containers, welfare cabins, anti-vandal containers and many more besides. Along with guaranteed low prices, we also continually monitor the quality and integrity of the containers we hire for your total peace of mind. What’s more, every container can be hired on a short or long-term basis – outstanding flexibility for maximum affordability. We offer ground-level units with drive-up access, from 32sqft up to 160sqft in size. We also offer 160sqft and 80sqft upper-level containers, along with a wide range of containers for hire and purchase with delivery included. Our collection of available containers for hire is always changing and being added to, so be sure to get in touch with your requirements. If you don’t see the container you require listed on our website, chances are we can still help you out. We also invite you to pay a visit to our site in person, if you’d like to inspect our containers and units a little more closely. Looking for the fastest, easiest and most affordable way to set up temporary office facilities? Our portable office container rental services have you covered! We offer a range of short and long-term premium office containers for hire, which are perfectly suited to commercial and business projects of every size. We make it easy for your business to set up the kind of temporary office space that’s clean, safe and reliable. Not to mention, available for at least 30% less than average site office hire prices. We tailor our container hire services to suit both the needs and the budgets of our customers – you won’t find more affordable office containers for hire anywhere else. Regardless of the shape, size or specification of the portable office you hire, we guarantee the same high quality and value for money. We’re constantly inspecting and assessing our containers for integrity, security and general quality, inside and out. What’s more, we’re happy to deliver and position the office containers you hire exactly where you need them. Convenience, peace of mind and guaranteed performance – it’s all part of our complete service package. If you can’t see your ideal containers for hire listed on our website, get in touch with our dedicated customer service team today. Looking to take site security to the next level? Anti-vandal cabins for hire are perfect for unsecured sites, exposed premises and the protection of important or valuable equipment. Our premium anti-vandal cabins for hire are available in a wide variety of shapes, sizes and specifications to suit all purposes. What makes anti-vandal cabins unique is the addition of security shutters for enhanced protection of windows and doors. Built from the most durable and heavy-duty metals from top to bottom, these durable portable cabins are ideally-suited for use in high-risk areas and scenarios. Protect what’s yours and enjoy total peace of mind with a premier anti-vandal cabin for hire! For a closer look at our complete collection of cabins for rent, we’d be delighted to show you around our facility in person. Or for more information on any of our products, give our dedicated customer service team a call today. Our welfare cabins are perfect for use on sites that lack important facilities, such as mains water, electricity, plumbing and so on. Providing site workers with bathrooms, rest spaces, canteen facilities and so on is a legal requirement every organisation must follow. Which is why we work hard to make high-quality welfare unit hire convenient and affordable to arrange. Whatever the size and type of your site, we can provide you with the market’s best welfare unit hire services. Our site welfare units for hire are available on short and long-term contracts alike for maximum convenience. We specialise in premium-quality mobile welfare cabins that both get the job done and speak volumes for your professionalism. Safe, clean and well-maintained – we personally inspect and verify every container we hire for your total peace of mind. For more information on any of our welfare unit hire services, give our customer service team a call today. Or for a closer look at what’s on offer, pop by our facility for a tour anytime. Provide your workforce with a safe, clean and enjoyable site accommodation for the lowest possible price. We went into business to demonstrate how the highest-quality site cabins and canteen containers on the market need not be overpriced. Whatever your needs and however limited your budget, we guarantee the best deal on site accommodation you’ll find anywhere on the market. Canteen containers are great for providing temporary dining facilities for site workers. Delivered and positioned by us, we make it easy to fulfil your legal requirements as an employer. What’s more, we personally inspect and verify each canteen container for outstanding quality, before allowing it to be hired. We offer a variety of short and long-term rental agreements to suit all purposes and pockets. So whether you need canteen containers for just a few weeks or perhaps a project scheduled to last several years, you can count on the same unrivalled value for money. What’s more, our site cabin hire prices are the lowest you’ll find anywhere in the region. Our canteen containers are available in multiple sizes and specifications – be sure to get in touch if you cannot find the exact unit you need here on our website. Alternatively, pop down to our facility at any time and we’ll give you a guided tour of what’s available to rent. The provision of clean, safe and reliable mobile toilet facilities is a legal requirement for employers in the UK. The way we see it however, fulfilling this essential obligation with mobile toilet hire doesn’t have to be expensive. We’re proud to offer an extensive range of portaloo hire packages – all available on short and long-term contracts alike. Whatever the nature of your site and workforce size, we can provide you with the portable toilet hire you need for the lowest possible price. Choose the perfect portable bathrooms for your site and we’ll deliver them, position them and leave you with the promise of unrivalled value for money. Our collection of portable toilets and toilet cabins is constantly changing and expanding, so be sure to get in touch if you can’t see exactly what you need listed here. What’s more, we welcome new customers to visit our site for a closer look at the products we offer. For more information or to discuss our portable toilet hire price structure, get in touch with our dedicated customer care team today.